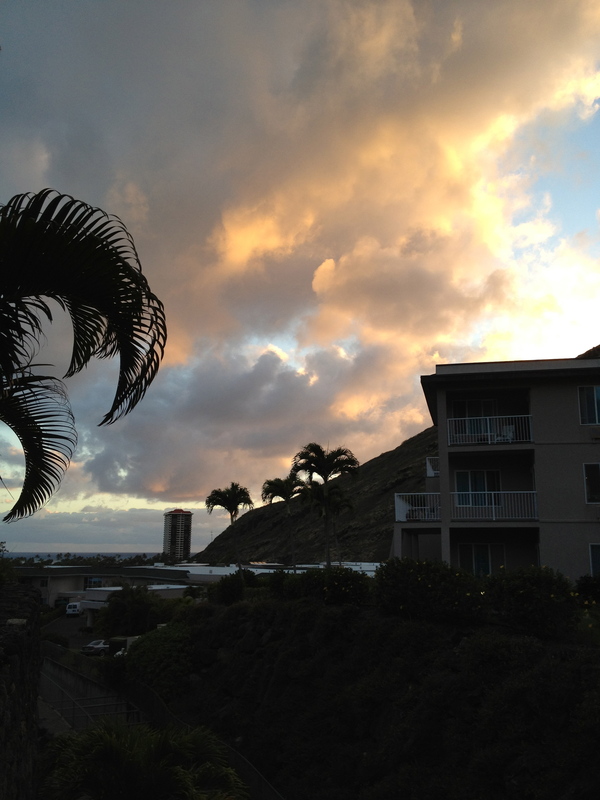 Home › sabbath rest › Home, Glorious HOME! Actually, it is BEING home that is glorious. The home could use a little help. 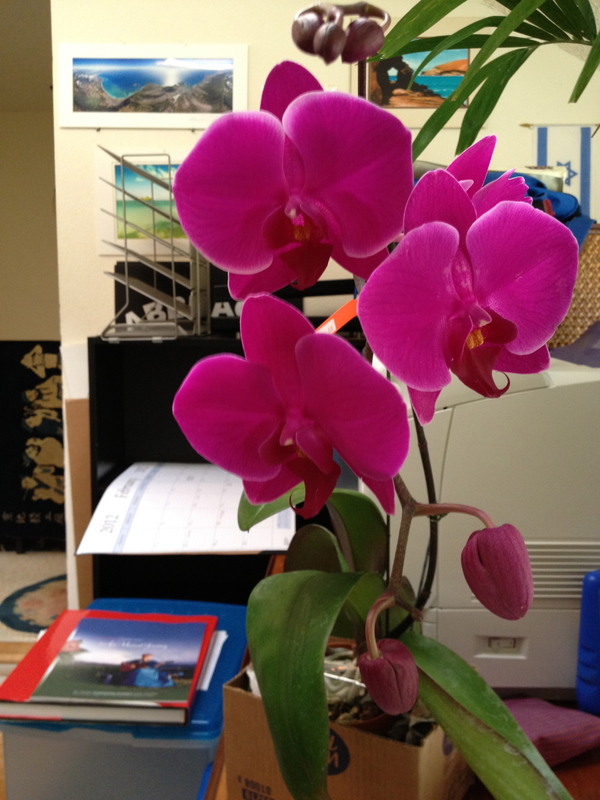 This gorgeous orchid is still in the box it came in because I have been out all day. I can only say THANK YOU, GOD that I am retired. I hate to think how tired I’d be if I had outside responsibilities. Today, after the Farmers’ Market, I went off with Kit to his band concert. 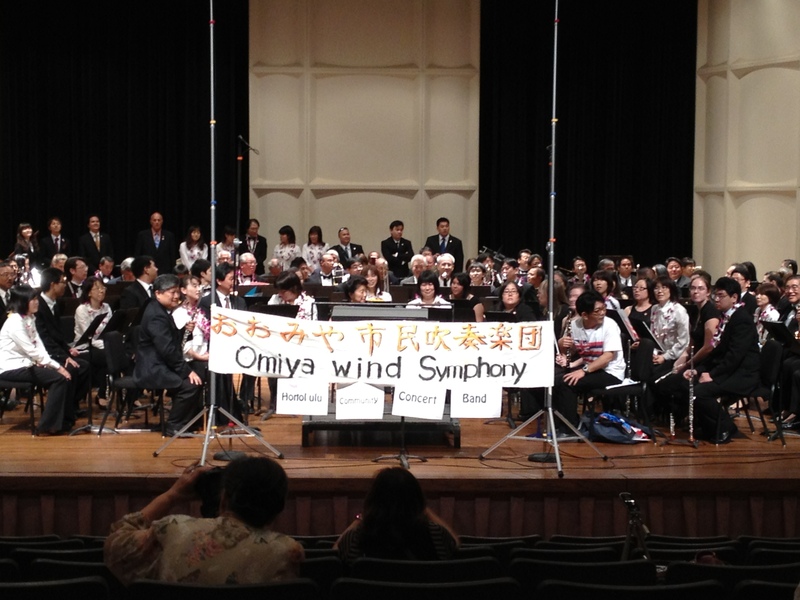 This was a joint concert with the Omiya Wind Symphony from Japan. We left at 11:00 a.m. for a 2:00 p.m. concert so I took lunch, water bottle, books, and my iPhone and iPad. I munched on lunch while both bands rehearsed. The music was marvelous! And when the concert ended there were, of course, photo ops. The Japanese had brought signs, flags and even a beach towel with the islands of Hawaii on it. All taped up or held up. Fun! Kit proceeded to come down with a cold right afterwards and sneezed all the way home. So we skipped the post-concert joint dinner. Arriving home at 6:00 p.m. Kit went to bed and I went to play scrabble with my mom. I must say, God, that I may go back to writing my blog in the morning! In the morning my mind is clear and all is waiting alluringly ahead of me. While at the end of the day my mind and heart are FULL. Well, full is too kind. Jumbled! That is a more accurate word. On the other hand, sitting and review my day is useful. Today was full of good things — enjoyable things — worthwhile things, even. BUT I am LONGING for TIME HOME ALONE! Longing for a FULL SABBATH Day. Well? Can I PRACTICE what I philosophically and spiritually embrace? Only with Your Help, God! ONLY with Your HELP!